NOTE: In March 2011 ESA announced a new way forward for the L-class candidate missions: IXO, EJSM-Laplace and LISA. At this time the IXO concept ceased to be a candidate and ESA, along with the scientific community, is now investigating to what extent a European-led mission could preserve the original science case of IXO. The new study is called ATHENA (Advanced Telescope for High ENergy Astrophysics). To collect as many photons as possible, IXO will have as large a diameter mirror assembly that can be accommodated within the constraints. Instead of the near-normal incidence optics used in telescopes that operate in the infrared through ultraviolet wavelength ranges, the IXO mirror assembly will consist of of optics elements that are almost edge-on to the incoming X-rays. The incoming X-rays must be reflected at small angles of incidence in order not to be absorbed. To be focused correctly, the X-rays must complete a double reflection, grazing off both primary and secondary mirrors. In the Wolter-I optical design used by XMM-Newton and other missions, the primary mirrors are parabolic in shape and the secondary mirrors are hyperbolic, though both can be approximated by sections of cones. X-rays of various energies are reflected more efficiently at different angles of incidence. This means that the desired effective area at the energy levels of interest dictates the optical design. In addition to the primary and secondary mirror sets, the mirror assembly will be equipped with a straylight baffle to block those incoming X-rays which would reach the mirror focus after only a single reflection. The height of the baffle is dependent on the cone angle of the mirror shells. Aluminium with a thickness of 30 microns is sufficient to block the stray X-rays. The mirrors for XMM-Newton were manufactured from gold-plated nickel and had thicknesses varying from 0.5–1 mm. The outer mirror diameter is 700 mm. Extending this technique to a diameter of 3.8 metres would result in a mirror assembly too heavy to be launched. Two new technologies are being investigated: mirror shell segments manufactured from slumped glass (NASA) and silicon pore optics (ESA). The IXO spacecraft is being designed to accommodate both types of optics and a choice will be made at the appropriate time. Silicon pore optics employs standard semiconductor wafer technology processes to produce rectangular plates that have thin ribs on one side, and thin membranes between the ribs. The plates are bent into the required shape, and several plates are stacked to obtain a stiff pore structure. The stacks are then mounted into a 'tandem' structure creating an approximation to the Wolter I geometry. Many pairs of stacks can then be assembled in an optical structure to form an X-ray mirror of the required dimensions. The predicted mirror module mass density is around 200 kg m-² , a factor of 10 better than older technologies. Silicon pore optics has been in active development for six years and is currently performing with a resolution of 15 arcseconds HPD (similar to the XMM-Newton performance) with individual pores already at 5 arcseconds (the IXO requirement). 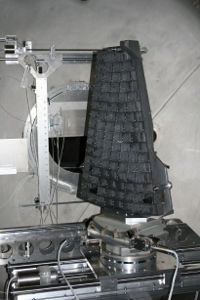 Left: An IXO mirror segment, or petal, during testing. Each petal will be constructed from hundreds of individual mirror modules (top right) which in turn are composed from stacks of silicon pore optic plates (lower right). Click on images for further information and credit details. A further challenge for the mirror design is that, in order to achieve the ≤5 arcsecond half-power diameter (HPD) requirement in-orbit angular resolution required for the IXO telescope, the primary and secondary mirror elements must be aligned and supported relative to each other with micron or sub-micron precision. The selected mounting system must be able to maintain the required precision during shipment and launch of the spacecraft. For slumped glass optics the mirror segments are shaped by placing glass on a shaped and polished mandrel and heating it until it slumps to take up the shape of the mandrel. The manufacturing technology limits the circumferential span of the sections to about 360 mm, so each concentric shell must be made up from a number of segments sized in accordance with this limitation. In the design currently under consideration, there are 360 concentric mirror shells, the inner shell having a diameter of about 750 mm and the outer shell 3.2 metres. Each shell is 0.4 mm thick and is made up of 12 or 24 segments, giving a combined total of around 14 000 segments for the primary and secondary mirrors. The shells are about 200 mm long in the direction of the telescope axis and a maximum of 360 mm in the circumferential direction – roughly the size of a sheet of A4 paper. The shell spacing varies from 2–5 mm and the total mass of the shells will be around 800 kg.